I seldom share my personal written prayers in public. But as the LORD mercifully answers this one may it be your reality too. So where did I get the idea that I am somehow an originator of love when you are not only the pioneer, picture and perfector of love, you are Love itself; or rather should I say, Himself? 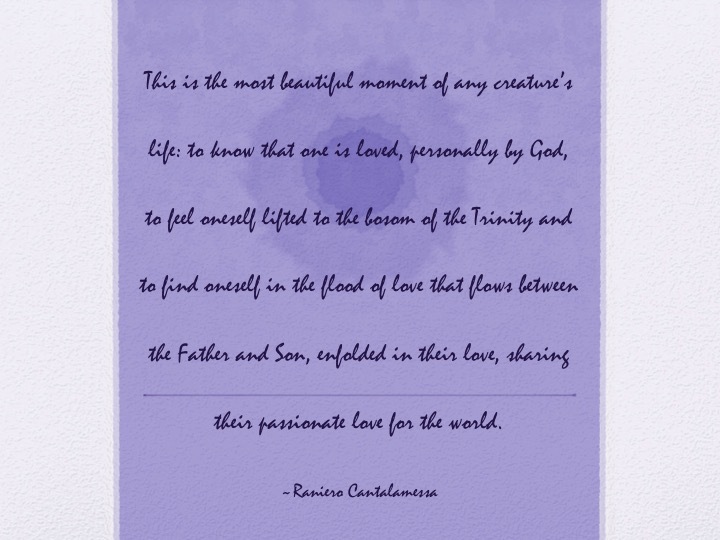 Today, I am happy to be caught in the cross-fire of the “love that flows between the Father and Son, enfolded in [your love], sharing [your] passionate love for the world” (Seamands 2005, 53). As I read about Jack frost (53-56) I wondered if the author had heard about me and retold my personal story with that pseudonym. You know I am a recovering workaholic, performance-driven, results-oriented, doing-more-than-being hard taskmaster, but you have been transforming me by the renewing of my mind since I began Fuller over a year ago. Thank you. And now if indeed Jesus is sending me as you sent him (John 20:21), o then may I feel afresh “the profound awareness of the Father’s affectionate love [as] the foundation of [my] ministry” too (63). May my sending (achievement) be out of a sense of being (acceptance), well-being (sustenance) and being-ness (status) (63-64). O how I often slip away from this foundation and time and again become a ‘loving worker’ instead of a ‘working lover’ (65). May I truly profoundly and experientially know your heart for me before having your heart for the nations (66-67). What a stark reminder, dear Lover and Lord, that who I am is more important than what I do not just because the latter flows from the former but that my identity as a son is proto, prime and permanent. If even I did nothing, I will always still be your beloved son in whom you are well-pleased. Profound. Wow! May you remove every known and unknown barrier to your love for me, may I feel your passionate phileo and even eros love for me—not just agape. I want to feel the fire of your love afresh in my soul. So! back to the beginning. I am happy to be caught in the cross-fire of that divine love which “is a burning fire; in all its intensity and infinity…has but one object and but one joy, and that is the only-begotten Son” (72). Thank you for including me in “the circle of that fiery love” (73). May I always be content to stay there—to just be. Seamands, Stephen. 2005. Ministry in the Image of God: The Trinitarian Shape of Christian Service. Downers Grove, IL: InterVarsity Press.